Numb3rs has been renewed for a fourth season it will start on September 28th with the first episode titled "Trust Metric", in this episode Colby is being interrogated by a man named Agent Kirkland, who passes him a handcuff key and gives him escape instructions. Don and his team get ....read more. Numb3rs Season 2 DVD - Pre-Order Now! Krumholtz and Mendes Team Up For Live! Numb3rs Season 1 DVD Is Out - Buy Now! NUMB3RS DVD - Pre-Order Now! Paramount Home Entertainment will release NUMB3RS: The Complete Second Season on DVD October 10, 2006 but you can Pre-Order Now at Amazon.com. The Box Set will include 6 discs and should be similiar to Season 1 DVD including anamorphic widescreen, Dolby Digital 5.1 audio and other extras like cast commentaries. Pre-Order Now! The NUMB3RS DVD has been released to Buy Now at Amazon.com. 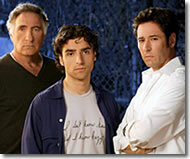 The Numb3rs DVD will be released May 30, 2006 or you can order the DVD at amazon. The DVD is a boxed set with a run time of 544 minutes that includes extras. Rob Morrow stars as FBI agent Don Eppes, who recruits his mathematical genius brother, Charlie (David Krumholtz), to help the Bureau solve a wide range of challenging crimes in Los Angeles. From two very different perspectives, the brothers take on the most confounding criminal cases, aided by Don's partner, Terry Lake (Sabrina Lloyd), and new FBI recruit David Sinclair (Alimi Ballard). Although their father, Alan (Judd Hirsch), is pleased to see his sons working together, he fears their competitive nature will lead to trouble. Charlie's colleague, physicist Dr. Larry Fleinhardt (Peter MacNicol), urges Charlie to focus more on his university studies than on FBI business. Inspired by actual events, NUMB3RS depicts how the confluence of police work and mathematics provides unexpected revelations and answers to the most perplexing criminal questions.